A few days back I was driving the long, rural commute between my house and my parish when my crummy, 1992 Dodge Caravan rust-bucket broke down on the side of the road. Breaking down is always inopportune, but this happened to be right in the height of the great Michigan blizzard of 2008 (see this post for some pics). Being that I am a frumpy anti-modernist with a strong streak of neo-Luddite in me, I of course have no cell phone, so my only plan of action was to get out and walk somewhere. The temperature was 10 degrees, and about 7 below zero with wind chill. Being that it is Michigan and winter, I did have a pair of snow boots, and I did have my winter coat and scarf. But through two odd flukes I did not have my winter hat and gloves, which I usually would have had with me. Therefore, I ventured out into the cold and began walking south towards the nearest town, probably a two mile walk. Well, without boring you with all the details of that horrible walk, let me just say that I almost froze to death. I've never been so cold in all my life. My ears hurt so bad I thought they'd have to be amputated (do they amputate ears for frostbite?). I had to keep my hands in my pants against the flesh of my thighs to keep them warm. At first I was not too intimidated by the two mile walk: most humans walk three miles an hour at their normal walking pace. But in this frigid wind in seemed like a desperate distance. I decided to try hitch-hiking, and wouldn't you know it, car after car after car drove by me without so much as a second look. I wasn't dressed shabbily. I was in my work clothes (office attire) with a very nice black dress coat on. I can understand single women passing me by, but time again I saw trucks with grown, burly men drive by and ignore me. There was also a lot of wimpy looking little guys in Hondas and Jettas as well. Everybody knew there was a town only two miles up. Everybody saw I was walking that way. Everybody knew it was 7 below zero. Everybody saw me frigid with no gloves or hat. Everybody saw my broken down van sitting on the side of the road. Yet nobody stopped. I couldn't help thinking of the parable of the Good Samaritan, and between my prayers for a ride and prayed, "Lord, don't hold it against them!" I even thought that perhaps I'd have better luck getting picked up if I layed down and pretended to be dead - then somebody would see the body, stop to call the police or something, and I could get up and say, "Hey, thanks for stopping!" But I was so cold that I thought I might actually die if I layed down and stopped walking. So, I lumbered on through the freezing air and biting wind. To make a long story short, I did get picked up a half mile from town by a guy on his way to work. He was a lot bigger than I and could have easily taken me out had I been one of those evil hitchhikers of urban myth. Everything worked out okay in the end, but not before at least thirty cars passed me by and my fingers almost froze. I was a little indignant at society that nobody would have mercy on someone obviously in dire need. But then I was even more shocked when I told my parish priest about it later in the day and he said, "Well, I don't blame them. In today's world you can't pick up hitchhikers. I probably wouldn't have picked you up if I were them either. You just can never be sure." It has been several days since I had this conversation with my pastor, and it has been rubbing on me all week. I knew I disagreed with something about his position there, but I couldn't put my finger on it. This, I think, is the crux of why my pastor's words irked me so: do we or do we not have an obligation to exercise charity when it is possible? Obviously we do. One of the corporal works of mercy is "clothe the naked." Now, I wasn't naked, but I think shelter someone who is freezing could be an extension of this precept. You will notice that there is no disclaimer, "Unless you live in 21st century America." This rule is binding at all times universally - to suggest that circumstances are different because we are modern and live in America would be, I think, a hint of the belief known as Americanism: that the doctrines and disciplines of the universal Church need to be interpreted differently in this country because we are somehow a "special case." Now, I'm not accusing my pastor of Americanism or anything. He's a great guy who is the most orthodox priest around. Since he is a pastor, he was coming at the problem from a pastoral angle that prioritized the safety of the persons involved. It is true, charity obliges us to love our neighbor, but it does not oblige us to recklessly put ourselves in danger (although that can be an act of heroic virtue at times). I understand that picking up hitchhikers has dangers inherent to it. I understand that I would not expect a woman driving alone who was 5'2" and 100 pounds to big up a 5'10", 178 lbs guy like me. But it is to the men who passed me by that I am addressing: to the construction guys, laborers, roofers and burly men that passed me by the dozens. Realistically, how much inherent danger is there for a big guy like that to pick up somebody? Is picking up a hitchhiker a "reckless" activity? "Boniface, it doesn't matter how big they are. You could have had a gun or something." True, true, but why do we apply this logic only when it comes to hitchhikers and not to so any other aspects of social interaction? Most people will answer their door if the doorbell rings. This is a much more threatening situation, I think. Why do you answer the door? After all, "he could have a gun?" What about when you are at the gas station pump and somebody comes up asking for directions? He could have a gun! Do you jump in your car and lock the door? Of course not; you give directions if you can. It's only with hitchhikers that we jump to this conclusion that they may be murderers - as if there is something inherently shady or devious about a person with no car needing a ride! I know what you're thinking. "Those all happen in day-time out in public. That's different." Well guess what, I was broke down in day-time in public too! It was 8:45 AM on a rural road that had plenty of houses all around and dozens of cars going by because it was that time of day. What type of murderer hitchhikes at 8:45 AM? The especially irking thing is everybody could see my broken down van sitting there with my footprints in the snow leading right from the van to me. It was painfully obvious to any unbiased observer that I was in need - the fact that it was 7 below made my need even more urgent. "Well, no matter what you say, I just never pick up hitchikers." a) You see somebody outdoors improperly dressed when it is below zero and they are in obvious discomfort. b) Their car is broken down right down the road in plain sight. c) It is the middle of the day. There's just no excuse. We can't let our society's own fears and paranoia's be some kind of justification for not exercising charity, especially if life could be on the line and the weather is extreme. I should also mention that its only Americans who have these scruples. In Europe hitchhiking is a commonly accepeted mode of transportation. I hitchhiked in Austria once and got picked up in about two minutes. But what about the possibility that the person could be armed or dangerous? Really, you never know. You can't make judgments based on appearances that are full proof. But there are two examples from the lives of the saints where men were shown hospitality, despite the fact that they were rogues. Now at that time three notorious robbers frequented the district, the which wrought many ill deeds therein; and upon a day they came to the said Place of the friars and besought Friar Angelo, the guardian, that he would give them something to eat; whereupon the guardian answered them after this manner, rebuking them harshly: "You robbers and cruel murderers, not only are ye not ashamed to rob others of the fruits of their toil, but, presumptuous and impudent that ye are, ye would even devour the alms which are sent to the servants of God. Unworthy are ye that the earth should bear you up; for ye have no reverence for men or for the God who created you. Go, then, about your business, and never show yourselves here again." Therefore were they wrath and got them thence in indignation. And lo! St. Francis returned from without, with his wallet of bread and a small vessel of wine, which he and his companion had begged; and, when the guardian had told him how he had driven those men away, St. Francis rebuked him severely, saying that he had borne himself cruelly, inasmuch as sinners are better led back to God by gentleness than by cruel reproofs; " For [said he] our Master Jesus Christ, whose Gospel we have promised to observe, saith that they that are whole need not a physician but they that are sick, and that He was not come to call the righteous but sinners to repentance; and therefore often did He eat with them. Seeing, then, that thou hast done contrary to charity and contrary to the Holy Gospel of Christ, I command thee, by holy obedience, that thou forthwith take this wallet of bread, which I have begged, and this vessel of wine, and seek them diligently, through mountains and valleys, until thou find them, and give them all this bread and wine in my name; and afterward do thou kneel down before them and humbly confess to them thy sin of cruelty; and then pray them in my name to do evil no longer, but to fear God and offend Him no more; and, if they will do this, I promise to provide for their needs, and to give them to eat and drink continually; and when thou shalt have told them this, return hither humbly." While the said guardian went to do his commandment, St. Francis betook himself to prayer and besought God that He would soften the hearts of those robbers and convert them to repentance. Obviously Francis had in mind their repentance and conversion, but note how he said the friar who drove the away was guilty of the "sin of cruelty." And Francis made this statement concerning men who were known to be robbers and brigands. If the friar was guilty of cruelty by treating known criminals this way, what are we guilty of who ignore the needs of someone in the freezing wind just because we are scared they might be evil? Another great example is the 9th century St. Meinrad of Einsiedeln, Martyr of Hospitality. He lived alone as a hermit upon a mountainside in Germany. One day, he was warned in a vision that two men were coming to see him who would bring about his death. Indeed, soon enough two men approached his hermitage. Their names are recorded as Richard and Peter, and the were notorious bandits from the region. Nevertheless, St. Meinrad went out and welcomed them and invited them into his house for food and drink. When the men went inside with him, they beat him to death with clubs. St. Meinrad knew the men were robbers, and knew by a vision that they would do him violence. Yet he thought this a lesser evil than to offend against charity by denying them hsopitality. If St. Meinrad acted thus for murderers, how should we act towards our fellow man? One last thing: I'm not just mad about this because it inconvenienced me. Like I said, I turned out okay. Somebody picked me up. I'm upset because of the mentality that we give in to fear by not assisting people, the idea that our fundamental, default attitude towards strangers is one of fear and wariness until they prove otherwise: an attitude of guilty until proven innocent. I'm upset because I'm sure this happens to a lot of people everyday who maybe never get picked up, and I don't think we ought to make justifications as to why the command to clothe the naked or feed the hungry somehow doesn't apply strictly to us. Wasn't the Middle Ages or the time of Christ more violent and dangerous than our own? Yet these rules applied then. Today really is no different. So, this is going to be one of those times (rarely) when I respectfully disagree with my pastor's opinion. Just to answer a questions I know will come up: no, that's not me in the picture. And, no, I'm still not going to get a cell phone. Please feel free to tell us about your own nightmarish hitchhiking stories. Yesterday in the Democratic Republic of Congo over 100 Catholic villagers were massacred inside a local parish church while worshipping. 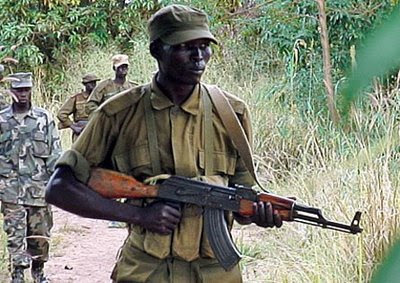 The attack was carried out by the Ugandan group the "Lord's Resistance Army." Worshippers were hacked to death with machetes and swords. There is not too much info out right now on the attack, nor is it clear why these particular villagers were targeted. One of the military captains who came upon the scene afterward said, "The scene at the church was unbelievable. It was horrendous. On the floor were dead bodies of mostly women and children cut in pieces.” Many of the LRA are none other than the same Hutu death squads who carried out the 1994 Rwandan genocide. Following the end of the genocide in 1994, the death squads were pushed out of Rwanda into neighboring Congo where they have continued an intermittent guerilla war for years. Please pray for the victims of the massacre and an end to violence in this region. 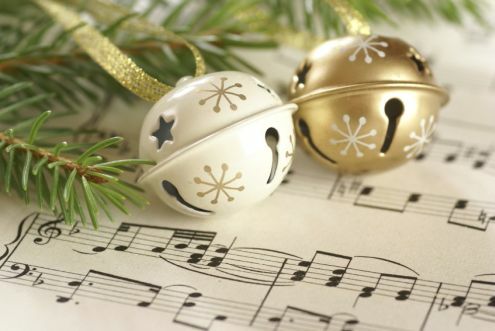 One of the things I look forward to most about this time of year is the music. I love Christmas music and think it has a wonderful appeal not only to the majestic truth of Our Savior's Incarnation, but from a musical standpoint I think it is some of the most beautiful music ever composed. I'm speaking, of course, of true Christmas music, not secular tunes like Winter Wonderland, the likes of which is repeated so ad nauseam that I cannot see how the cheesy line about "Parson Brown" is even remotely amusing to anybody anymore. However, I am still conflicted. There is such an amazing corpus of religious Christmas music available out there, yet year after year we seem to stick to the same, tired dozen or so songs that we have always sung. Joy to the World. Hark! The Herald Angels Sing. We Three Kings (really an Epiphany song). Silent Night. The First Noel. Come All Ye Faithful. O Come, O Come Emmanuel (technically an Advent song). Angels We Have Heard On High. God Rest Ye Merry, Gentlemen. Away in a Manger. What Child is This? Taken in isolation, these are all great songs. They are some of the best loved melodies of all time. I still get teary eyed at times when I hear a really good rendering of Hark! The Herald Angels Sing or The First Noel. The problem is that these songs are not only played for Christmas Masses in Church, but are also repeated endlessly in the secular world. From Thanksgiving on we hear these songs in Wal-Mart, on the phone when we are on hold with a utility company, over the annoying local station that plays Christmas music 24/7, on the Musak at McDonalds, at the office Christmas party. We are utterly inundated. Therefore, these hymns, beautiful in themselves, come to be robbed of much of their majesty by the time we hear them on Christmas. Furthermore, since Christmas is traditionally an octave in the Catholic Church, we end up hearing these songs in Mass for eight more days after the Christmas Vigil. By that time I usually find myself utterly exhausted by them, and dealing with some sort of spiritual jet-lag: that is, the secular world has moved on past Christmas but spiritually I am supposed to be still singing Christmas songs as late as the first week of January. Another ill side effect of living in a culture where the sacred and the secular are so at odds. I've posted the lyrics in italics below each of the videos with a little commentary on what I like about the song. Enjoy. The holly and the ivy, when they are both full grown, Of all the trees that are in the wood, the holly bears the crown. Refrain: Oh, the rising of the sun and the running of the deer, The playing of the merry organ, sweet singing in the choir. The holly bears a blossom as white as lily flower, And Mary bore sweet Jesus Christ to be our sweet saviour (Refrain). The holly bears a berry As red as any blood And Mary bore sweet Jesus Christ To do poor sinners good (Refrain).The holly bears a prickle As sharp as any thorn; And Mary bore sweet Jesus Christ On Christmas Day in the morn (Refrain). The holly bears a bark As bitter as any gall; And Mary bore sweet Jesus Christ For to redeem us all (Refrain). Some dismiss this song as too pagan because of its references to holly and ivy and their connection to Norse paganism. I would say that a revival of Norse paganism is probably the last thing we need to worry about in our liturgies (unless you live in the neo-pagan Diocese of Albequerque), and that any connection with medieval tradition is good; but I would also point out that despite the Nordic elements, the verses are very Christian and contain some beautiful medieval typology regarding the various elements of the holly plant and how they symbolize Christ. This tune is believed to be over a thousand years old, and the reference to the organ as "merry" points to a very Catholic origin for this hymn, since English literature in the post-Reformation times always refers to the organ as "somber" or "majestic." The arrangement above is not my favorite, though it is by far the most well known. The best arrangement I know of this song I have only ever heard on this CD; I have actually uploaded this version onto YouTube and made my own video of it, which you can see here. I highly recommend listening to this if you are only familiar with the popular arrangement; It is more upbeat and contains alternating parts for males and female voices, and (in my opinion) does a much better job of matching the text to the music. I am not sure, but I think the arrangement may be by Robert Shaw. Lo how a rose e'er blooming From tender stem hath sprung Of Jesse's lineage coming As seers of old have sung. It came a floweret bright Amid the cold of winter When half spent 'twas the night. Isaiah 'twas foretold it, This rose I have in mind. With Mary we behold it The Virgins mother kind. To show His love so bright She bore for us a Savior when half spent was that night. O flower whose fragrance tender With sweetness fills the airDispel in Glorious splendor. The darkness everywhere True man yet very God From sin and death now save us And share our human load. This is undoubtedly one of my favorite Christmas songs of all time, and to be fair, I have heard it included in the Christmas liturgy at some parishes, though not as frequently as I would like. Its typology is simple yet profound, based on the Book of Isaiah, speaking of Jesus as the Root of Jesse and the Branch of the House of David, not unlike the O Antiphon for December 19th, O Radix Jesse. Of all the hymns for Christmas, I think this one best expresses the wonder with which we marvel at the Incarnation of the Word. Charlotte Church actually has a version of this that is really beautiful. King Jesus hath a garden, full of divers flowers,Where I go culling posies gay, all times and hours. Refrain: There naught is heard but Paradise bird, Harp, dulcimer, lute,With cymbal, trump and tymbal, And the tender, soothing flute. The Lily, white in blossom there, is Chastity:The Violet, with sweet perfume, Humility (Refrain). The bonny Damask-rose is known as Patience: The blithe and thrifty Marygold, Obedience (Refrain). The Crown Imperial bloometh too in yonder place,'Tis Charity, of stock divine, the flower of grace (Refrain). Yet, 'mid the brave, the bravest prize of all may claim The Star of Bethlem-Jesus-bless'd be his Name! (Refrain). Ah! Jesu Lord, my heal and weal, my bliss complete, Make thou my heart thy garden-plot, fair, trim and neat (Refrain). I think of all the hymns listed here, this one has some of the most beautiful typology, in which the classic theme of comparing virtues to different flowers is taken up. This song is very contrary to the modern mindset, in which something like a flower is seen only in context of its scientific or biological category and without any typological consideration as to what the flower as such may represent in the bigger picture. I think this hymn is a great meditation on virtue and the beauty of the good life, and though it does not have anything to do with Christmas per se, it is traditionally labeled as a Christmas song and this seems to be fitting for such a lovely song on the garden of Christ. Hail! Blessed Virgin Mary! For so, when he did meet thee Spake mighty Gabriel, and thus we greet thee. Come weal, come woe, our hymn shall never vary. Hail! Blessed Virgin Mary!Hail! Blessed Virgin Mary! Ave! Ave Maria! To gladden priest and people The angelus shall ring from every steeple,To sound his virgin birth. Alleluia! Ave! Ave Maria! Ave! Ave Maria! Archangels chant, 'Hosanna! 'And, 'Holy! Holy! Holy!' Before the Infant born of thee, thou lowly, Aye-maiden child of Joachim and Anna. Archangels chant Hosanna! Archangels chant Hosanna! This song is a straightforward hymn of praise. Can there be any doubt about it with all the hosannas, aves, alleluias and hails? Despite being a very simple, yet powerful melody and lyrics very accessible to the common person. I have for some reason never heard this beautiful hymn incorporated into any liturgy, whether Christmas or Marian. It's reference to the "angelus" ringing from every steeple marks it as unquestionably Catholic and fitting for any Marian feast, or especially for the Nativity. The tree of life my soul hath seen, Laden with fruit and always green:The trees of nature fruitless be Compared with Christ the apple tree. His beauty doth all things excel: By faith I know, but ne'er can tell The glory which I now can see In Jesus Christ the apple tree. For happiness I long have sought, And pleasure dearly I have bought: I missed of all; but now I see' Tis found in Christ the apple tree. I'm weary with my former toil, Here I will sit and rest awhile: Under the shadow I will be, Of Jesus Christ the apple tree. This fruit doth make my soul to thrive, It keeps my dying faith alive; Which makes my soul in haste to be With Jesus Christ the apple tree. Besides having a beautiful melody, this song has much to endear itself to us: it speaks of the bitterness of the world and compares the beauty of Christ with the most beautiful of all blossoms, that of the apple tree. The comparisons throughout between the tree of life, Jesus, and the apple tree are very vivid and do what allegory does best: fuse images of the beautiful according in the natural world with the spiritually beautiful truths of the faith. A very wonderful and edifying song. Besides Hail, Blessed Virgin Mary, all these songs have one thing in common: a rich typological vocabulary that helps our minds rise to marveling at the heavenly truths of the faith by means of beautiful images from the natural world. I want to issue a challenge to pastors, liturgists and music directors: next Christmas, consider temporarily retiring some of the weary old popular songs that we here year after year and incorporate some of these lovely but underappreciated classics into your Christmas/Advent lineup. You will be doing everybody a big favor. 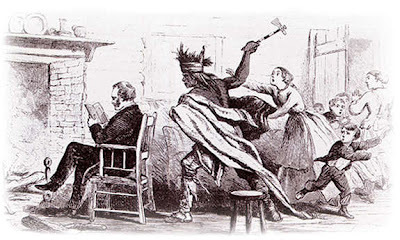 A depiction of the killing of Dr. Marcus Whitman in the 1847 Whitman Massacre. As if he'd be reading a book at the fireplace completely oblivious to all that commotion behind him! I seem to have been reading alot about Native Americans and Indian-white conflicts as of late. I think this was partially inspired by my reading of Saint Among Savages (bio of St. Isaac Jogues) earlier this year, as well as a history of the Seneca Indians, followed by a rewatching of Last of the Mohicans and the presentation of two-part class on Church history for the parish with a large focus on the Jesuit missions in Canada. Following along on this Indian theme, I recently started reading the Atlas of the North American Indian by Carl Waldman (linked up on the sidebar). It is a comprehensive atlas of the locations of every major (and some minor) Indian tribes from the mound builders right up to today. The book is politically correct and very shabbily written, but its a nice resource for its many maps showing Indian tribal lands in relation to modern boundaries. At any rate, it also has a lengthy tribe-by-tribe history of each group's conflicts with whites. One interesting situation I read about had to do with the Cayuse Indians who lived in eastern Oregon and eastern Washington in the Blue Mountains region. Their geographical location made them an interesting case: due to their proximity to California, they had already been contacted by Spanish settlers and had been introduced to Catholicism. From what I've read, the Cayuses had not been exposed to the Spanish Franciscan missionary activity long enough to have adopted the Faith in any real way, but they were friendly to the priests at least. In 1836 American pioneers began coming into the Cayuse lands from the east under Protestant missionary Marcus Whitman. Whitman came with an influx of a thousand other pioneers and trappers, and has been described as rigid and contemptuous of the Cayuse Indian traditions. Other sources attribute this hostility to the Indians not to Marcus but to his wife, Narcissa. At any rate, the Indians soon found themselves with the Catholics on their west and the Protestants on their east, each vying to convert them. However, shortly after the arrival of the Americans, a smallpox epidemic broke out and decimated the Cayuse population. The Cayuse held Whitman personally responsible for the outbreak of the epidemic, and the Cayuses plotted to kill him. On November 27th, 1847, a band of Cayuse descended upon the Whitman homestead and murdered Whitman, his wife and thirteen others. This violence sparked a war called the Cayuse War that ravaged the Oregon Territory for the next eight years. At the end of the fighting, the Cayuse who had committed the murders were turned over to the American authorities and given the choice of choosing either Catholic or Protestant rites at their executions. They unanimously chose Catholic rites and received baptism, confirmation and eucharist before being hanged. Despite the fact that a Catholic priest, Fr. John Baptist Brouillet, aided the victims of the Whitman massacre and helped bury the dead, local Protestant clergymen soon began accusing the Catholic missionary priests of inciting the Cayuse to commit the murders. The Protestant minister Rev. Henry H. Spalding, a companion of Whitman's and an anti-Catholic agitator, acutally published a tract in which he formally accused the local Catholic clergy of instigating the revolt, a charge that was strongly denied by the local Catholic priests. However, Spalding's tract was reprinted many times for the next fifty years and accepted as fact by many Protestants in Oregon and abroad until it was discredited in 1901. The interesting thing about the Cayuse story and the Whitman Massacre is that it reveals an Indian tribe caught in two culture clashes: that of Indian vs. white, and then that of Protestant versus Catholic. It is interesting how given a choice between which rites to undergo at death, they chose those of the Catholic Church. This underscores the often observed fact that Catholic missionaries usually developed much better rapport with Indians than their Protestant counterparts. This may account for the Cayuse adhering to the true Faith -- or perhaps it was the beauty of their rites, the same thing that convinced Vladimir of Russia to adopt Christianity over Islam and awed the Aztecs when they first saw Cortez and his men chanting at a Solemn High Mass in Tenochtitlan. Too bad the Anglo-American policy of extermination ended up being the road our nation ultimately went down. As I mentioned last year at this time, I always seem to fall into a depression as Christmas approaches. Last year I pondered this in the context of Christmas carols, and why many of our most treasured carols seem to have a melancholy aire about them which is both wistfully nostalgic and softly depressing. I cited as reasoning for this a perceived rupture between the ideal of a traditional, pleasant Christmas with family and the harsh reality of an indvidiualistic, commercially driven holiday which we actually experience. I'd like to expand these thoughts beyond just the realm of music and state that after another year of reflection and another season enduring an even more commercialized Christmas, I think the disconnect runs throughout every element of the holiday, not just the musical aspect of it. People tend to get frustrated and upset when the reality of anything falls short of the ideal. This is perhaps the root philosophical source of the discontent of many Trads at the state of the Church: the fact that the sad reality of the Church's condition falls so far short of the glorious ideal to which she is called and has been given the means of grace to attaint to. I think one reason Christmas time can be so depressing for people is that the reality of a politically-correct, commercialized Christmas falls far short of the ideal of the Spirit of Christmas and what a worthy celebration of this holiday should look like. In fact, I'd say one would be hardpressed to find a sharper divergence between reality and ideal than in the American approach to Christmas. Even if a family decides they are going to not get sucked in by the commercialism and tries to do the holiday a little bit more traditionally (integrating Christmas within the preperatory season of Advent, focusing more on the spiritual aspect of it, dumbing down the amount of merchandise purchased), the lesson is going to be a bitter one for children whose friends, cousins (and anyone else who is is secularized but close enough to your family that they can't be ignored) will be showing off all of their new gadgets at the family gatherings, giving rise to a kind of confused envy in the children who understand that mommy and daddy celebrate Christmas differently but nevertheless wish they could have the cool stuff that secularized Uncle Jeff always seems to buy for spoiled Cousin Jake. This brings to mind a conversation that I had recently with a Catholic literature professor: it is not enough that individual families agree to practice the faith and hold fast to our Catholic Traditions. It takes a whole community and a surrounding culture to create a climate in which those customs and mores are taken as the norm. Sure, I can do Christmas traditionally if I want, but as long as I am surrounded by secular family and friends, my kids are going to have the painful realization that our way is not the norm but a deviation from the norm. That in itself is not bad -- I am perfectly fine being considered a social deviant. But it causes the children to think of our ways as odd eccentricities that they may grow up to be embarassed by or at least apathetic to. This is why organizations like homeschool groups and like associations are so essential. I am blessed to be part of a large homeschool group in my area that has created a kind of Catholic subculture that permeates everything done by these families. Catholicism is not then restricted to the family alone, but it is seen and practiced by every other adult the child comes in contact with, creating the (accurate) perception that traditional, faithful Catholicism is the ideal and normative means of human existence. Whiel their education remains personalized and specialized for their particular needs (since they are homeschooled), their upbringing can hardly be said to be individualistic. It is communal in the truest sense. There is much truth in the old saying that it takes a village to raise a child. Which brings us back to individualism, perhaps the biggest thing standing in the way of reclaiming a truly Catholic Christmas. Individualism is hard to shake once one has tasted of it and experienced the addicting satisfaction of putting oneself first. Only prayer and penance can defeat it. 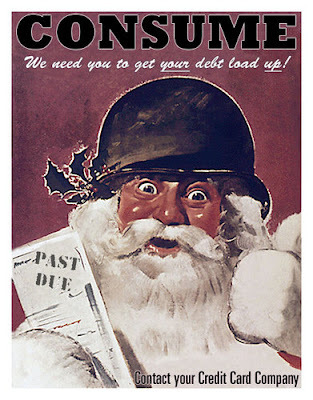 The Pope has expressed hope that the financial crisis will help to roll back consumerism and allow people to experience the true meaning of Christmas. Let us hope so. So, while I am finding myself depressed this Christmas, I also have great reason to be thankful. It is the paradox of Christian life: the surface can be blown from pleasure to sadness, contentment to depression at times, but there is an underlying substrata of joy that comes from the indwelling of the Spirit and the knowledge that everything will be put right in the end. Considering the name of this blog as well as the pseudonym of its founder, it seems appropriate to bring up every now and again the famous Bull Unam Sanctam promulgated on November 18, 1302 by Pope Boniface VIII. The famous last lines of this document (in the translation provided at http://www.papalencyclicals.net/) run as follows: "Furthermore, we declare, we proclaim, we define that it is absolutely necessary for salvation that every human creature be subject to the Roman Pontiff." This, needless to say, has caused no little bit of controversy. It is, however, as is often the case, useful to look at the Latin text more carefully in order to see what is being said here. Porro subesse Romano Pontifici omni humanae creaturae declaramus, dicimus, definimus, et pronunciamus omnino esse de necessitate salutis. My best effort at a literal translation is this: "Furthermore, we declare, we say, we define, and we pronounce, to every human creature, that to be under the Roman Pontiff is altogether of necessity for salvation." Particularly interesting is that the critical word "omnino" is not an adjective modifying "necessitate" but an adverb modifying "esse". According to the Dictionary of Ecclesiastical Latin, "omnino" means: altogether, entirely, totally, utterly. According to the New College Latin Dictionary, "omnino" means: altogether, entirely, wholly; (w. numerals) in all; (in generalizations) in general; (in concessions), no doubt, to be sure, yes, by all means. In other words, it is the existence of the necessity that is "absolute", but not necessarily the necessity itself. I would thus argue that the English translation usually given, with the words "absolutely necessary", is extremely misleading and even damaging to the Church inasmuch as it gives the impression that the Church has changed her teaching on this point, which was clearly taught in such a way as to imply infallibility. Let me try to make this more clear. In regards to matters of necessity, one can distinguish on the one hand between a necessity of means and a necessity of precept, and on the other hand between an absolute and a hypothetical (or conditional) necessity. I would take the adverb "omnino" modifying the verb esse as indicating that the necessity is one of means rather than of precept, while leaving open the possibility that it is nevertheless a hypothetical (or conditional) necessity. 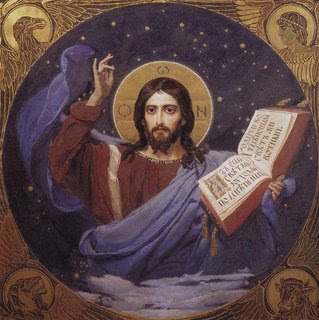 In the Caput Firmiter, the Fourth Lateran Council (1215) declared: “The universal Church of the faithful is one outside of which none is saved” (extra quam nullus omnino salvatur). D 430. This was the teaching also of the Union Council of Florence (D 714), and of Popes Innocent III (D 423) and Boniface VIII in the Bull “Unam sanctam” (D 468), Clement VI (D 570 b), Benedict XIV (D 1473), Pius IX (D 1647, 1677), Leo XIII (D 1955), Pius XII in the Encyclical “Mystici Corporis” (D 2286, 2288). As against modern religious indifferentism, Pius IX declared: “By faith it is to be firmly held that outside the Apostolic Roman Church none can achieve salvation. This is the only ark of salvation. He who does not enter into it, will perish in the flood. Nevertheless equally certainly it is to be held that those who suffer from invincible ignorance of the true religion, are not for this reason guilty in the eyes of the Lord” (D 1647). The last proposition holds out the possibility that people who in point of fact (actu) do not belong to the Church can achieve salvation. Cf. D 1677; 796 (votum baptismi). The necessity for belonging to the Church is not merely a necessity of precept (necessitas praecepti), but also a necessity of means (nec. medii), as the comparison with the Ark, the means of salvation from the biblical flood, plainly shows. The necessity of means is, however, not an absolute necessity, but a hypothetical one. In special circumstances, namely, in the case of invincible ignorance or of incapability, actual membership of the Church can be replaced by the desire (votum) for the same. This need not be expressly (explicite) present, but can also be included in the moral readiness faithfully to fulfil the will of God (votum implicitum). In this manner also those who are in fact outside the Catholic Church can achieve salvation (Fundamentals of Catholic Dogma [Tan Books, 1974], p. 312). In regards to invincible ignorance, and this must be stressed, in-vincible means un-conquerable. There are three kinds of ignorance, only one of which is invincible. Allow St. Thomas Aquinas to explain (I'll note in advance that it is the third kind of ignorance discussed by Aquinas that is said to be invincible, thus making one action (or in this case omission, namely to join the Catholic Church, truly involuntary. Further, an action (or omission) is "involuntary" when it can be said truly that you would not have done it had you only known). I answer that, If ignorance causes involuntariness, it is in so far as it deprives one of knowledge, which is a necessary condition of voluntariness, as was declared above (a. 1). But it is not every ignorance that deprives one of this knowledge. Accordingly, we must take note that ignorance has a threefold relationship to the act of the will: in one way, "concomitantly"; in another, "consequently"; in a third way, "antecedently." 1. "Concomitantly," when there is ignorance of what is done; but, so that even if it were known, it would be done. For then, ignorance does not induce one to wish this to be done, but it just happens that a thing is at the same time done, and not known: thus in the example given (Obj. 3) a man did indeed wish to kill his foe, but killed him in ignorance, thinking to kill a stag. And ignorance of this kind, as the Philosopher states (Ethic. iii, 1), does not cause involuntariness, since it is not the cause of anything that is repugnant to the will: but it causes "non-voluntariness," since that which is unknown cannot be actually willed. 2. Ignorance is "consequent" to the act of the will, in so far as ignorance itself is voluntary: and this happens in two ways, in accordance with the two aforesaid modes of voluntary (a. 3). First, because the act of the will is brought to bear on the ignorance: as when a man wishes not to know, that he may have an excuse for sin, or that he may not be withheld from sin; according to Job 21:14: "We desire not the knowledge of Thy ways." And this is called "affected ignorance." Secondly, ignorance is said to be voluntary, when it regards that which one can and ought to know: for in this sense "not to act" and "not to will" are said to be voluntary, as stated above (a. 3). And ignorance of this kind happens, either when one does not actually consider what one can and ought to consider; this is called "ignorance of evil choice," and arises from some passion or habit: or when one does not take the trouble to acquire the knowledge which one ought to have; in which sense, ignorance of the general principles of law, which one to know, is voluntary, as being due to negligence. Accordingly, if in either of these ways, ignorance is voluntary, it cannot cause involuntariness simply. Nevertheless it causes involuntariness in a certain respect, inasmuch as it precedes the movement of the will towards the act, which movement would not be, if there were knowledge. 3. Ignorance is "antecedent" to the act of the will, when it is not voluntary, and yet is the cause of man's willing what he would not will otherwise. Thus a man may be ignorant of some circumstance of his act, which he was not bound to know, the result being that he does that which he would not do, if he knew of that circumstance; for instance, a man, after taking proper precaution, may not know that someone is coming along the road, so that he shoots an arrow and slays a passer-by. Such ignorance causes involuntariness simply (Summa theologiae I-II, q. 6, a. 8). A question from a reader: The Catholic Church is accused of being an accessory to the murder of thousands in Latin America in the 1970’s and 1980’s. Has the Church taken a defensive position in this matter? (1) The Church has formally condemned Communism on many occasions, the strongest being in the 1937 encyclical Divini Redemptoris of Pius XI. This often created an unnatural alliance between the Catholic Church and Rightist groups (Batista in Cuba, Franco in Spain) who also were out to destroy Communism. This was the case in the Colombian war of 1946-1953 (known as "La Violencia") in which the Catholic majority sided with the conservatives against the Communist aggressors. (2) In states where Left wing, Socialist or Communist groups took power, the Church always sufferred extreme persecution. Such was the case in Mexico between 1917-1934 and in Cuba from 1960-1969. (3) In some states where Right wing governments were in control, the Church was still mistrusted because of its care of the poor; many saw the Church as a seat of Leftist agitators. This was the case in El Salvador during the civil war of 1980-1992, in which the famous Archbishop Romero was assassinated by a government Death Squad. (4) In many Latin American countries, the rural clergy have made alliances with Communist groups and have sometimes incited them to violence. This has happened in Brazil and Nicaragua, where the hierarchy supported the Communist Sandanistas against the Rightist Somozas. After the Sandanistas took power, however, they began to persecute the Church for its alleged support of the Contras and the Americans. As you can see, the position of the Catholic Church in Latin America is a complicated one indeed and only an in depth study of Church-State relations in every individual country could due full justice to the question. Often times the accusations against the Church in this region are part of leftist propaganda meant to discredit their right-wing opponents or are part of the “Black Legend” that attempts to tarnish Catholicism by lumping it in with many real and imaginary abuses of the Spanish in Latin America. Today the 7th grade history class that I teach is taking their Midterm Examination. I have uploaded the exam they will be taking to Google Docs so that all of you can take it as well. Please visit this link and try your knowledge of Early Modern History. A few of the questions pertain to some specific books we read, but I think most of it could be considered general knowledge. You'll have to print it out if you feel inclined to do the map coloring section. All questions refer to European and American history from about 1500 to 1648. Good luck! I was very pleased to see in this month's issue of Columbia a rather large write-up praising the Carmelite monastery of Carmel of the Immaculate Heart of Mary in Wyoming, Diocese of Cheyenne. 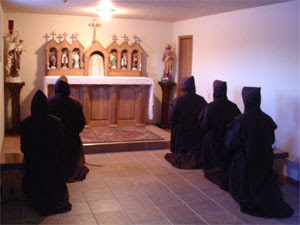 The article also had a brief discussion about the Rite of the Holy Sepluchre, which to my knowledge is only used by this particular group of monks and is also known as the Carmelite Rite. If St. Louis is known as the Rome of the Midwest, perhaps Wyoming needs to be known as the Rome of the Wild West. The establishment of the monastery can be traced to Bishop David Ricken, a bishop personally ordained by John Paul II who wanted to be on the forefront of the "new evangelization." While we may have unhappy associations with that favored JP2 term, Bishop Ricken thankfully interpreted it in a very practical and orthodox way. Instead of closing parishes and appointing more lay ministers, Bishop Ricken rightfully saw that the key to true renewal began with prayer, and he set out to establish a monastery in his diocese. He says, "I knew I wanted a contemplative monastery of monks or nuns- or both - in daily prayer for the support of the diocese." The diocese at large has enthusiastically embraced the monks and has received many blessings from them -- Father Daniel Mary, founder of the monastery, says that many people write letters testifying to answered prayers through the monks' intercession. The constitution of the foundation is based upon the guidelines of St. John of the Cross and St. Teresa of Avila. The monks are divided up into choir monks and lay brothers. There is daily Mass, along with the traditional eight hours of the Divine Office, and as mentioned above, the liturgy used is the Carmelite Rite (Rite of the Holy Sepulchre). The Rite was once used by the Hospitallers, Templars, and orders associated with the patriarchate of Jerusalem during the Crusades. 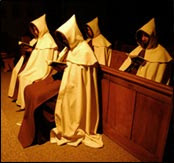 The Carmelite Rite has many unique aspects to it: the absence of liturgical colours, the sparing use of altar candles (one at low Mass, none on the altar itself at high Mass but only acolytes' torches, even these being extinguished during part of the Mass, four torches and one candle in choir for Tenebræ); incense is also used rarely and with noteworthy restrictions; the Blessing at the end of the Mass is only permitted where the custom of the country requires it; passing before the tabernacle, the brethren must make a profound inclination, not a genuflexion. The calendar retains many feasts proper to the Holy Land, like some early bishops of Jerusalem, and feasts of the patriarchs Abraham, Isaac, Jacob and even Lazarus. Further elements: The altar remains covered until the priest and ministers are ready to begin, when the acolytes then roll back the cover; likewise before the end of the Mass they cover the altar again. On great feasts the Introit is said three times, i.e. it is repeated both before and after the Gloria Patri; besides the Epistle and Gospel there is a lesson or prophecy to be recited by an acolyte. At the Lavabo the priest leaves the altar for the piscina where he says that psalm, or else Veni Creator Spiritus or Deus misereatur. Likewise after the first ablution he goes to the piscina to wash his fingers. During the Canon of the Mass the deacon moves a fan to keep the flies away, a custom still in use in Sicily and elsewhere. At the word fregit in the form of consecration, the priest, according to the Ordinal of 1312 and later rubrics, makes a movement as if breaking the host. One aspect of the Rite I particularly like is that after the Pater Noster, a Deus venerunt genies is sung for the restoration of the Holy Land. Reminds me of the old prayers for the Holy Roman Emperor in the Canon of the Mass. It is no wonder that the Diocese of Cheyenne is being blessed by the presence of this community! Of course, as you can imagine, vocations are blossoming. Father Daniel says that the community has a large waiting list due to lack of space. Currently there are 40 men waiting to discern entry into the community, and he receives 150 new inquiries every year. The monastery is seeking to purchase more land on nearby Carter Mountain, which was once owned by the famous convert Buffalo Bill Cody. Of course, this is the same diocese that brought in Wyoming Catholic College, also as part of Bishop Ricken's plan for evangelization in his diocese. Though Bishop Ricken is no longer there (he has been moved to Green Bay), good things continue to come out of Cheyenne. We should keep an eye on this place! My blogging friend Jeff Pinyan (Japhy) from the Cross Reference put together this papal quote generator which I understand is more statistically accurate than the Fisheaters one, and will give you longer and more amusing papal quotes. Check it out here. "As far as possible the lay faithful are formed by the Bishops who are members of the episcopate of that territory than the ecclesial circumstances of another territorial entity might require. Nevertheless, canonical legislation makes provision for an Episcopal Conference to "be erected for a smaller or larger territory so that it really is the Feast of the Holy Spirit who constitutes the baptized as "living stones" founded on Christ, the "corner stone", and destined to "be raised up into a spiritual house, to be a "sign" of that interpersonal communion of love which constitutes the spiritual foundation of ecumenical dialogue." I'm sure many of you have seen this already, but in case you haven't, check out this John Paul II Random Quote Generator over at Fisheaters. It's absolutely hilarious and I will be using it all night. You could put together a real bonafide JPII encyclical from these quotes. Click here. The unprecedented liturgy of conscience will deepen the restoration of our new Springtime. Cardinal Tauran has "thanked" Islam for bringing God back into the mind of European culture. Most of what he says in this particular article (which you can read HERE) is more of the same interreligious dialogue stuff we've heard before, but he uses some interesting words. For example, when talking about the need to open communication with other faiths, he says that all relgions are "condemned to dialogue." Condemned? I'm not sure what he was getting at here, but the Reuters article connects the statement with a recent statement by the Pope in which the Holy Father said that interreligious dialogue had to presuppose the possibility that one side is ultimately convinced by the other, which for me personally has been the elephant in the living room in the whole interreligious dialogue issue. But I don't understand the Cardinal's point about religions being condemned to religious dialogue, unless he is addressing the anguish that orthodox Catholics endure when "condemned" to hearing about such nonsense as the Assisi Prayer Meetings, etc. But what about this idea of Muslims bringing God back to Europe? Doesn't it presuppose that Allah is the same God as the Triune God of Scripture? It must, otherwise the Muslims wouldn't be bringing God to Europe, but would be bringing in only a false-god, which of course I contend they do. They're not bringing "God" back to Europe, at least not the God we want to associate with. Thanking Muslims for introducing God to Europe is like thanking Wiccans for bringing back spirituality or thanking Jehovah's Witnesses for their evangelism efforts. The Muslim god Allah is not the same as the Trinity, nor does he even share similar characteristics. It is foolishness to thank them for bringing Allah into Europe, as if Allah is what Europe needs. Ask Charlemagne, Don Juan, the Franciscan martyrs, Jan Sobieski, St. John Capsitrano or Constantine XI if Allah is what Europe needs! But also, the manner in which Allah is introduced into European discussion is a negative one: religion is not being discussed because European Muslims are such outstanding citizens and such wonderful witnesses to sanctity that Europeans are wanting to talk about religion. No: they are promoting religious discussion because of things like the riots over the Mohammed cartoon, the murder of Theo Van Gogh in 2004, the French riots of 2005, the insane outrage over Benedict's Regensburg speech, the continued headscarf controversies in Europe and the many other ways in which Islam is bullying its way ever so slowly into a dominant position in European life and brutally attempting to silence those who oppose it. Even if we grant that discussing religion is a good thing (which it is), this is not the manner that people should want it brought to light. Thanking Islam? Only in the upside-dwon, anti-Christian nuthouse we call modernity could members of the Vatican be persuaded to happily thank the people who are cutting their throats. How many of you attend a regular, Novus Ordo parish? How many of you cannot remember the last time your parish produced a seminarian, let alone one who went all the way through to ordination? I come from a pretty good parish, but it has only become decent in the last three years or so. I have asked around from many people who have been here for a decade or more, and none of them can remember the last time a seminarian came from our parish (I am happy to say that I know of at least three young boys here now who feel a call to the priesthood but are still too young to enter seminary). I even asked one woman who has been here for thirty years, and neither could she tell me the last time a seminarian had come from our parish. And yet down the road but three or four miles, there is another parish which has eleven seminarians studying for the priesthood just this year. Eleven out of thirty-seven total in the diocese. Out of ninety parishes in our diocese, one parish alone supplies almost one third of all seminarians. Furthermore, this is not new. In the eight years I have been paying attention, this particular parish always churns out seminarians the way Central Asia churns out barbarian hordes. Year after year, more and more seminarians come from this parish, causing their pastor to humbly boast that his parish has produced the most seminarians east of the Mississippi. By the way, this parish happens to be the one parish in our diocese dedicated to the Charismatic Renewal. And let me point out, I do not just mean they use guitar in their Masses (that would be an oversimplification of what it means to be charismatic), but this entire parish was founded as an extra-territorial parish dedicated to serving the needs of an already existing cluster of charismatic Catholic families. Now, is it the Charismatic Renewal alone which brings these vocations? I don't think so. We Traditionalists also are aware of other parishes and dioceses which spring way ahead in vocations. They are parishes where Tradition is maintained, where Latin is used, where the Traditional Mass is offered, where Gregorian Chant is the norm and where orthodoxy and Catholic culture are the heart of parish life. Traditional oriented institutions, like the FSSP, the Diocese of Lincoln and the Dominican Sisters of Mary, Mother of the Eucharist have had no lack in vocations -- some have so many they are turning people away. So, on one end, we have a great number of vocations from the Charismatic Renewal parish, and on the other, a great deal from Traditionalist bodies as well. This brings us around to the oft speculated connection between charismatic Catholics and Traditionalists. Though there are many threads of connection there, I think the reason these two types of parishes seem to spit out vocations at high velocities is because they both have a very fundamental issue in common: a personal relationship with Jesus Christ. We know that the Charismatic Renewal emphasizes a personal relationship with Christ -- almost in ways and means that have earned them the approbation of Traditionalists and the label of crypto-Protestants. Perhaps this is the case at times. But we ought to think why we are reacting: is anybody really against having a personal relationship with Christ? Of course not. If you are, you don't know what it means to be Catholic. Yet, this is what Traditionalists share in common with Charismatics: a deep reverence and devotion to the Person of Jesus Christ. We might not use the Protestant phraseology "personal relationship with Jesus," but is that not what we are cultivating when we spend hours before the Blessed Sacrament, piously meditate on the Gospels or pray the Rosary? What else are we striving to develop? Pious feelings? The mere appearance of sanctity? No, of course not. It is all geared towards better knowing and loving the One True God and His Only Begotten Son, with Whom we hope to spend eternity. When there exists true devotion to Christ, people are enraptured by love of Him and willing to lay down their lives for Him, and there (and only there) will young men realize the joy or giving their lives over to Him in the priesthood. This is also why dissenters, heretics, progressives are the way they are: they lack devotion to Christ. "Boniface, that is being way too broad. Are you saying that if anybody disagrees with you then they don't have a relationship with Christ?" Well, not on account of somebody not "agreeing" with me. But, yes, to the degree that a person professes heresy, embraces progressivism or dissents, then yes, they lack a relationship with Christ. Because if they did know and love Jesus as a real and active Person, a presence in their lives, they would never be able to say and do the things they do, because they would realize how offensive these things are to God and would understand that Christ commands rigorous adherence to the truths He came to teach us and the life He empowers us to live. No person who had a true relationship with Jesus and understood why He suffered and died could possibly equivocate on the question of abortion or any other moral issue. In my opinion, it is Traditional Catholicism which best promotes devotion to the Person of Christ, for the whole liturgy and devotional life of Traditional Catholicism is oriented towards honoring God (instead of affirming the people). If you read the writings of some of the great saints, especially St. Therese of Lisieux, you will see how their whole lives were permeated by a very personal love for Jesus Christ, which was fed by the Church culture they operated and lived in. The Charismatic Renewal, while serving a valuable function, is a symptom of the lack of reverence for Christ in our Church. It is only because the mainstream Church since Vatican II has failed in its duty to promote proper devotion to Christ that so many Catholics turn to the Charismatic Movement for that sense of personal, unrestricted devotion to God. And I am glad they do. "He who is not against us is for us" (Luke 9:50). But if the Church had been faithful to its tradition, then we might never have needed a Charismatic "Renewal" to renew us, and the only pity about the Charismatic Renewal is that so many Catholics feel obliged to look for their spirituality and their source of renewal outside of the Traditions of the Church. Whatever type of parish we attend, promote personal devotion to Jesus Christ, and everything else will fall in to place. Conversely, if we lack personal devotion to Jesus, nothing else that we do in our parishes will really matter. "Some people have taken serious offense in the Holy Mass for young people which was celebrated by the Viennese Cardinal Christoph Schönborn on the 16th of November in Wolfsthal, a village close to the Austrian-Slovakian border. In contrast to the presumption, due to the in many ways amateurish und unrealistic recorded broadcasting by Gloria TV, it must be clearly stated that in this celebration in no way any kind of liturgical specifications have been violated. The Eucharistic bread was unleavened and its shape strictly followed the shape which has been used in the Middle East since the 1st century. The “flat cake” is similar to that form used in Mossul in these days – this is the metropolis located at river Tigris where Christians still testify the truth of Jesus with their own blood. Werner Pirkner, the spiritual councillor for the Holy Mass in Wolfsthal, and Stephan Bazalka, coordinator of the Catholic Youth, paid highest attention to the fact that when breaking the bread no tiny little piece of bread ever touched the floor. What I wanted to comment on was the tone of the response letter and point out how it is problematic and indicative of a wider mentality in the Church that ought to be addressed. If we look at that video above, we see many problems relating to the decorum of the Mass: the music, the lighting, the bizarre setting (you can see from the video that this is obviously a Church or basilica of some kind: are all the innovations in the setting just to make it more "relevant? "), the weird vestments, the novel ceremony of writing prayers on a card and attaching them to balloons to be set free during Mass, the presence of what appears to be wooden bowls used to hold the hosts (not precious metal) and finally, the questionable bread used for the Eucharist. My point here is that there was not just one thing wrong with this picture, but many. Any one of these abuses listed above could be the subject of an entire post. However, the Cardinal, in response to the outcry against him, addressed only the last subject: that of the bread used in the Sacrament. He says that it is unleavened and perfectly in accord with the Church's disciplinary standards, and then tells us all who criticized him to repent for daring to question his judgment! As if the question of the bread were the only thing wrong with this picture! No mention of the balloons, the music, everything else (probably because there is obviously no defense for those items). This reponse is indicative of what has been identified before as a conservative Catholic mindset that liturgical rubrics and decorum do not really matter so long as there is a valid Eucharist and the Real Presence can be affirmed. "Why do you complain so much about the music? Just be happy that you're receiving Jesus!" This is essentially what the Cardinal's response is: it was a valid sacrament, so therefore nobody can say anything. Nothing else matters. By the way, did you notice the Cardinal's explanation for the bread? The statement said: The Eucharistic bread was unleavened and its shape strictly followed the shape which has been used in the Middle East since the 1st century. The “flat cake” is similar to that form used in Mossul in these days – this is the metropolis located at river Tigris. Okay, that may be the case. Fine and good. But you can't deny that the bread looks like leavened bread, can you? Can the Cardinal really be so upset at Catholics not realizing that this bread was unleavened when it clearly looks to be leavened? How dare you didn't realize that the bread is actually a Middle Eastern flat cake used in Mosul! I mean, c'mon! How many Catholics would see that and say, "Oh, of course! That's a flat cake from the Mosul-region of Iraq!" Please. Long story short: (1) Even assuming the bread was unleavened, the Cardinal should still apologize for everything else that went on at that Mass (2) Catholics (especially mainstream conservatives) should realize that you can have quite a bit of wiggle-room with the liturgy and still maintain the facade of legitimacy under the canard of "it's still a valid Sacrament" (3) We should all pray for Cardinal Schönborn and realize that not everybody who is labelled a "conservative" may necessarily be a friend to Catholic Tradition.